Countries within the Nordic power market have initiated a number of electricity interconnector projects, many of which will be commissioned in the next four years. 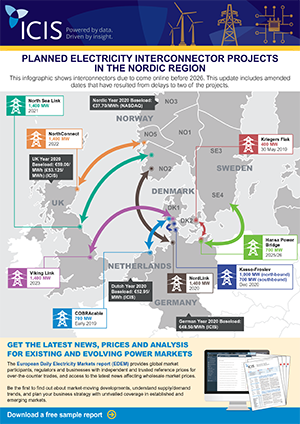 This updated infographic by ICIS energy deputy editor, Christopher Somers, shows which price zones the interconnectors will link to and includes amended project dates that have resulted from delays to three of the projects. This updated infographic shows amended project dates that have resulted from delays to three of the projects.